Each year in this space, we close out the Speculator's preseason calendar with a look at some longshot league leaders and award winners. Don't worry, these out-on-a-limb predictions shouldn't have influenced your draft day plans anyway, and most (if not all) have already received some Speculator pub this winter. It's not at all interesting to predict a Mike Trout MVP or a Max Scherzer Cy Young Award. Around here we dig deeper, so while "longshot" is a loose term, we'll keep this list to anybody who went outside the Top 150 picks this preseason. American League: Simply put, Willians Astudillo (C, MIN) rarely strikes out. He did so just 81 times in 2,265 career minor league at-bats, which translated well to the majors with a 97% ct% in just 93 AB in 2018. Astudillo's biggest obstacle to the batting title might just be qualifying for it—he's projected for only 40% playing time, but he managed to crack MIN's Opening Day roster and can play third base in a pinch. The 5-9, 225-pound backstop holds plenty of value in two-catcher leagues, as his bat-on-ball plate approach has .300 written all over it. National League: Corey Dickerson (OF, PIT) became a line-drive machine in 2018 (27% LD%), while he also saw one of the biggest upticks in contact rate from 2017 (74% ct%) to 2018 (84%). In fact, Dickerson was one of just three hitters with an 84% ct% and 25% LD% going outside the Top 150 (min. 300 AB; Markakis, Lucroy), and his 106 HctX last year says it wasn't all just soft contact. Dickerson has hit .300 or better in three of his last five seasons, and if he can hold the new line-drive stroke, our 2019 Straight Draft Guide cover boy might unlock an even higher level. AL: It was just a year ago that Delino DeShields Jr. (OF, TEX) was a trendy Top 150 pick, as he'd stolen 29 bags in just 376 at-bats the season before. Now DeShields is barely cracking the Top 400 thanks to a 2018 season where he: 1) hit .218, 2) got demoted to Triple-A, and 3) suffered through hand and head injuries late in the year. DeShields should get a shot at redemption as the everyday CF in Texas, and could even bat leadoff should 36-year-old Shin-Soo Choo get hurt or traded. DeShields has the ingredients—excellent raw speed, plus plate patience, and a lower strikeout rate in 2018—for a shot at 40+ SB. He's a fine recency bias rebound target. NL: Garrett Hampson (2B, COL) is in the middle of a highly-watched battle for Colorado's 2B job with Ryan McMahon. Hampson has other paths to playing time (SS, OF) if the keystone doesn't work out, any of which would let his game-changing speed flourish. Hampson went 36-for-41 on the basepaths in Double-A and Triple-A in 2018, and has the plate skills (85% ct%, 0.75 Eye in the minors) to get on base often. Our Park Factors confirm Coors Field is heaven for RHB (+16% BA, +22% HR, +17% runs), and their lineup looks strong; all Hampson needs is an everyday gig, and he could post monster BA/SB totals. 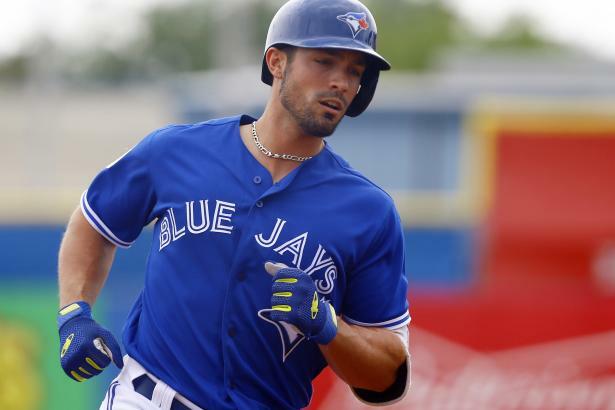 AL: Randal Grichuk (OF, TOR; pictured above) struggled in April and missed all of May (knee), then proceeded to smash 23 HR over the season's final four months. Grichuk gets plenty of air (47% FB% in 2018), which allows his elite raw power to thrive (140 career xPX; 9.5% barrel rate, seventh-best in 2018). Traditionally a hacker, Grichuk even cracked the 70% ct% mark for the first time in his career last season. The fly balls and whiffs will still cost you in batting average, but there's 40+ HR power lurking with a full season of at-bats. NL: Hunter Renfroe (OF, SD) showed why he was once considered a top prospect with a monster second half (22 HR in 246 AB). The 27-year-old paired noticeably more loft (46% FB%) with an elite 164/148 PX/xPX down the stretch, and the power was well-balanced between left- and right-handed pitching. With a steadily improving contact rate (73% ct% in 2018), Renfroe's skill-supported power boost means his "UP: .270-40-100" from the 2019 Baseball Forecaster is certainly in play. AL: Dylan Bundy (RHP, BAL) has been an afterthought this draft season—a 7.61 ERA in the second half of 2018 will certainly do that—but he can miss a ton of bats thanks to a devastating slider (27% SwK, MLB slider average: 17%) that he throws one-fourth of the time. Bundy has issues with the long ball and pitches for a Baltimore team that will struggle for wins, but with 170+ innings and a 12%+ SwK in each of the last two seasons, Bundy has the stamina and raw stuff to make a run at 200+ strikeouts this season. NL: This one's a real longshot given that he pitched just 77 innings last year, but on a per-inning basis, Caleb Smith (LHP, MIA) might rack up Ks with the best of them. He had plus whiff rates with all three of his primary pitches last year—a fastball (11% SwK), change-up (17%), and slider (16%)—ending up with a 10.3 Dom. Smith should have enough leash to stick in Miami's rotation for most of the year, which makes him one of the better sources for strikeouts in the endgame. He was recently profiled by our own Brian Rudd in an excellent Facts/Flukes column. AL: Tyler Glasnow (RHP, TAM) has always had the talent; maybe he just needed a change of scenery? The skills flourished after Glasnow was traded to Tampa Bay last July; he put up a 64/19 K/BB, 64% FpK, and 3.40 xERA in 11 starts with his new team. Glasnow throws just two pitches: an upper-90s fastball (10% SwK) and devastating curveball (18%) that both miss bats with ease. He was tabbed as a "premium speculative target" in a recent Starters Buyers Guide from Stephen Nickrand, and a full season in Glasnow's new digs could give him a shot at the "UP: 3.00 ERA, 200 Ks" from the Forecaster. NL: Kenta Maeda's (RHP, LA) arsenal features a devastating one-two punch; he had a 26%+ SwK on both his change-up (15% usage in 2018) and slider (23%) in 2018. Maeda was one of just nine pitchers with a 15% SwK and 63% FpK last year (min. 120 IP); the other eight are all Top 60 picks. We're hedging that LA keeps Maeda in the rotation long enough to qualify, but if he gets the innings, he misses enough bats and limits enough walks to make a run at an ERA title.